Beginners & seasoned players, all are welcome. The most important part of gameplay is laying a strong foundation. Classes available every Saturday, 5pm to 7pm. Come with an open heart & mind. There are no pre-requisites for this class. The last line of defence for every floorball team, the goalie plays a crucial role in determining the team's success. Fast reflexes & decisive actions are key to this role. Suitable for aspiring goalies aged 6 & up. Classes available every Saturday (5pm to 7pm) & Sunday (3pm to 5pm). Have a question on our classes? Our FAQ section may have the answer you need. Classes available every Saturday 5pm to 7pm, & Sunday 3pm to 5pm. Pre-requisites: Young athletes must have basic floorball skills like dribbling, ball control & stick handling. For ages 6 to 18. Click here for detailed map. 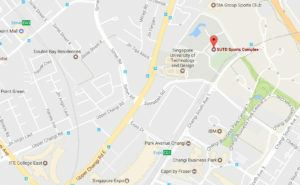 Board at Changi City Point (96381), Changi South Avenue 2 in about 9 min. Alight at Changi Business Park Terminal, Changi South Avenue 1, 2 stops later. Bus 31 Board at Tampines Interchange (75009), Tampines Central 1 in about 12 min. Alight at After Simei Avenue, Upper Changi Road East, 6 stops later. Let us know your preferences - Level, Skills, Dates & Timings - & we will arrange a coach for you!